Speed cameras will be installed at one of Birmingham&apos;s most notorious spots for speeding, it was announced in July. 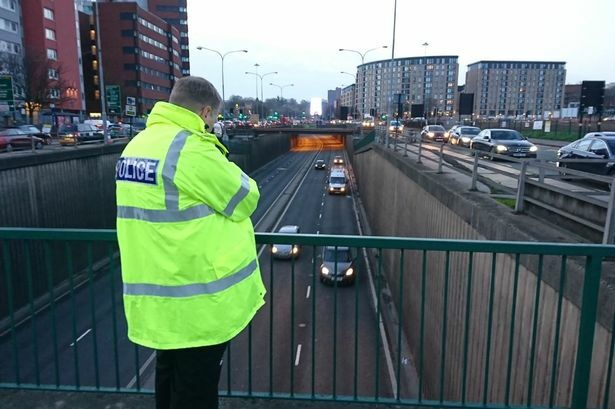 The site on Belgrave Middleway witnessed one of the city&apos;s worst ever accidents when six people were killed last year but council chiefs unveiled plans to fit average speed cameras along a 1.7-mile stretch of the A4540 ring road. Following the multi-vehicle crash in December 2017, a petition calling for extra safety measures was signed by more than 28,000 people. The new speed cameras will monitor the 40mph-limit section from Five Ways roundabout at Edgbaston to Haden Circus at Highgate. There were warnings in July that two new West Midlands Metro tram routes would come in "tens of millions of pounds" over budget. Sean Pearce, director of finance with the West Midlands Combined Authority, told its investment board the Brierley Hill extension and new Birmingham to Solihull route were both exhibiting "cost pressures". The proposed Birmingham to Solihull line has a total budget of £675 million but was forecasted to reach £735 million while the Brierley Hill extension was estimated to overrun its £310 million budget by £33 million. Mr Pearce assured the board&apos;s members that work was already under way to bring them back into budget. Birmingham City University announced plans to turn a historic former cycle factory into a £60 million hub to help the city&apos;s small businesses, arts organisations and academics. The derelict Belmont Works site, built in 1899 and once home to Eccles Rubber and Cycle Company, will be transformed into the second phase of the university&apos;s STEAMhouse project, joining phase one in Digbeth. The building, which has stood derelict since being gutted by a fire in 2007, will receive an extension to its rear façade and new spaces but it will also retain many of its original features. It will contain free facilities such as 3D printers, laser cutting machinery, virtual reality technology and printing studios and provide a new home for the university&apos;s school of computing. A project to revamp Birmingham&apos;s historic Grand hotel went back to the drawing board this month after plans for the city&apos;s first rooftop pool overlooking the cathedral were dropped. Principal Hotel Company, which is opening a hotel in the Colmore Row building, revamped and resubmitted its designs for the venue, also scrapping a proposed spa, gym and roof terrace in favour of five more bedrooms. No reason was given for the re-think on the open-air, rooftop pool but the plans proved popular with Birmingham Post readers when they were first unveiled in May 2017. The change came shortly after the owner of Principal Hotel Company was sold by its US owner to French investors Foncière des Régions. Designs for the Commonwealth Games athletes&apos; village in Perry Barr were revealed in August. The city council unveiled its masterplan for the former Birmingham City University campus which will be capable housing up to 6,500 of the world&apos;s finest athletes alongside officials taking part in the 2022 Games. Once the multi-sport festival is finished, the site will be converted into around 1,400 new houses, including social, affordable, private renting and homes for sale. Birmingham Airport&apos;s historic first terminal building was preserved after being awarded grade II listed status by the Government. Opened by the Duchess of Kent in 1939, the iconic Elmdon Terminal and Control Tower building is famous for its over-hanging canopies which resembled aeroplane wings. The Elmdon was last used as a main terminal building in 1984 since when it has specialised in private flight for wealthy individuals, VIPs and royalty as well as providing offices for airport staff until its closure earlier this year. During its heyday, the original terminal building housed a public bar, tea lounge and restaurant and its concrete &apos;wings&apos; provided cover to passengers below and balconies for viewing flights. Transport chiefs announced a £150 million expansion of the West Midlands Metro fleet by adding up to 50 new battery-powered trams. Transport for West Midlands launched a tender process to find an established supplier of the vehicles which are capable of running on both conventional overhead cables and battery technology. The latter removes the need for a complete reliance on overhead electrical wires as is currently the case and allows trams to switch instantly to battery power on sections of the track where wires cannot be built, such as under Five Ways island in Edgbaston. Transport for West Midlands said it was initially planning to purchase 18 of the new battery-powered trams, with the option to buy a further 32 in the future. Birmingham Museum and Art Gallery announced in August it was to close for at least three years - only to backtrack on the decision three months later. The museum in Chamberlain Square said it would shut down in October 2019 as part of a redevelopment of the council house which required a major overall of its electrical system among other projects. But in November it was confirmed the closure would be postponed until after the 2022 Commonwealth Games in order to allow the museum to be open to international visitors. The postponement did not change the museum&apos;s ambitions to redevelop the building, a spokesman said.